This module has been developed to enable Users to manage the business of non-franchised product procurement. It enables Enquiries to be easily recorded and generates RFQ's. These enquiries can be seamlessly converted into Customer Quotes and then into Orders. As with the other modules within the system, an online history of transactions is maintained and the module is fully integrated. Documents are transmitted automatically between companies using fax or email. Management control of the Enquiry Process function. Fast turn around on enquiries. Quotes, Proformas and orders automatically generated. RFQ's can be generated and transmitted by fax, email, spreadsheet (MS Excel Compatible CSV file) or XML. Automatic import of Supplier repsonses with spreadsheet enquiries. Simple conversion to quotation, proforma invoice or a sale. Sophisticated nominated costings from purchase history or stock. Enquiry workbook for each customer contains detailed history. Efficient handling of multiple currencies. Automatic link to the Purchase order module. 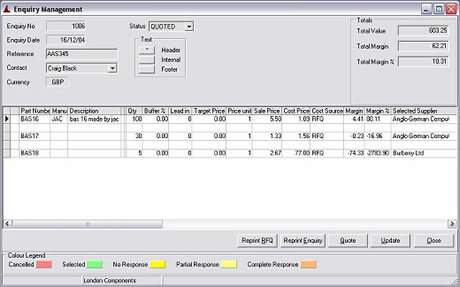 Enquiry processing module enquiry management screen.